Notes for Work, Energy and Power chapter of class 11 physics. Dronstudy provides free comprehensive chapterwise class 11 physics notes with proper images & diagram. Whenever a force acting on a body produces a change in the position of the body, work is said to be done by the force. If there is no change in the position of the body, work is not done. Our special definition of the word work does not correspond to the colloquial usage of the term. Thus, we may exert a large force on a wall, but if the wall remains where it is, then we have not done any work. We may be doing hard work in physiological sense, but from the point of view of physics, we are not doing any work. If a coolie holding a heavy box on his head is standing at a fixed location, he is not doing any work. Work is said to be done only when there is a displacement in the direction of force. The work done by a given force on a body depends only on the force, the displacement, and the angle between them. It does not depend on the velocity or the acceleration of the body, or on the presence of other forces. When several forces act on a body one may calculate the work done by each force individually. The net work done on the body is the algebraic sum of individual contributions. Work done by a force may be positive or negative depending on the angle between the force and displacement. 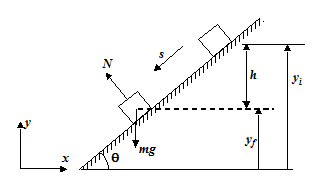 If the angle is acute ( < 90o), then the work done is positive and the component of force is parallel to the displacement. If the angle is obtuse ( > 90o), the component of force is antiparallel to the displacement and the work done by force is negative. However, the work done by the gravity (or the force by the earth on the body) is negative since force (vector) and displacement (vector) are oppositely directed and hence =1800 . A box is moved over a horizontal path by applying force F = 60 N at an angle  = 30o to the horizontal. 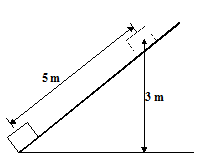 What is the work done during the displacement of the box over a distance of 0.5 km. There is a misconception that the force of friction always does negative work. In reality, the work done by friction may be zero, positive or negative depending upon the situation. In figure (a), when a block is pulled by a force F and the block does not move, the work done by friction is zero. 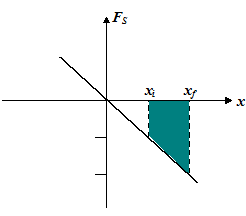 In figure (b), when a block is pulled by a force F on a stationary surface, the work done by the kinetic friction is negative. In figure (c), block A is placed on the block B. 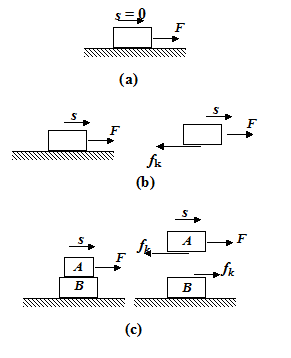 When the block A is pulled with a force F, the friction force does negative work on block A and positive work on block B. The kinetic friction and displacement are oppositely directed in case of block A while in case of block B they are in the same direction. Consider a block of mass m which slides down a smooth inclined plane of angle . 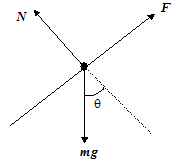 Let us assume the coordinate axes as shown in the figure, to specify the components of the two vectors - although the value of work will not depend on the orientation of the axes. The work done by the force of gravity on a particle depends only on the initial and final vertical coordinates. It does not depend on the path taken or on the speed of the particle. The work done by gravity is zero for any path that returns to its initial point. Here, we must first find the force with which the block must be pushed. We begin by drawing a F.B.D. of the block. N = Normal reaction by the incline on the block. W = F. S cos 00 = 60 5 = 300 J.
or (10 10 N) (3m) = 300 J, the same as before. The only difference is that with the incline he could do the job with a smaller force i.e. 60 N but he has to push the block a greater distance i.e. 5 m up the incline than he had to raise the block directly (3m). This application also illustrates the point that machines (simple or complex) can not save the amount of work that has to be done to accomplish a job, they merely allow us to do the job with less effort. The negative sign signifies that the force always opposes the extension (x > 0) or the compression (x < 0) of the spring. In other words, the force tends to restore the system to its equilibrium position. Graphically, the work done by the spring force in a displacement from xi to xf is the shaded area (as shown in the figure, which is the difference in the areas of two triangles. (2)The work done by the spring force only depends on the initial and final positions. (3)The work done by the spring force is zero for any path that returns to the initial position. When already stretched or compressed spring is allowed to regain its natural length, work done by the spring force is positive. 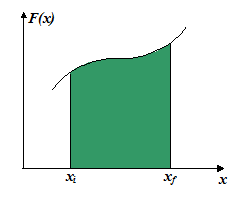 In general, the work done by a variable force F(x) from an initial point xi to final point xf is given by the area under the force - displacement curve as shown in the figure . Area (work) above the x - axis is taken as positive, and below x-axis is taken as negative. A horizontal force F very slowly lifts the bob of a simple pendulum from a vertical position to a point at which the string makes an angle qo to the vertical. The magnitude of the force is varied so that the bob is essentially in equilibrium all times. What is the work done by the force on the bob? Figure is a free body diagram of the system and shows the forces acting on the bob. 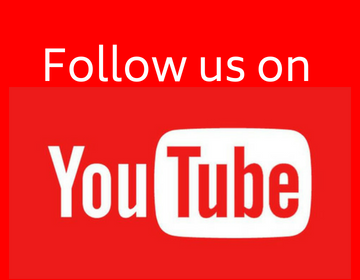 Since the acceleration is zero, net horizontal force and net vertical force on the bob must be zero. This is how the force must vary as a function of angle q in order for the bob to be in equilibrium. From figure, we see that , thus, dy = tan dx. Work as defined, depends on frame of reference also. When we change from one inertial reference frame to another inertial reference frame, the force does not change, while displacement may change, so the work done by a force will be different. For example, suppose a person is pushing a box in a moving train (in the same direction as the movement of train) by applying a force F on it. In the reference frame of the train, the work done by the force will be F. S where S is the displacement of the block with respect to the train. But in the reference frame of the earth the work will be F. (S + S0) where S0 is the displacement of the train with respect to the earth.